HELP!!! Winter is coming! I love being able to watch the seasons change but I DO NOT LIKE WINTER AND THE SNOW! 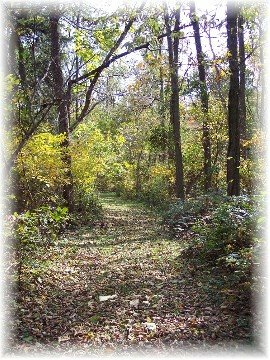 This picture was included in Stephen Weber's Daily Encouragement Net devotional today and it reminded me of the path that I cut down to the creek in our back woods. A few weeks ago it looked a lot different. In a few days there will be no leaves. Reminds me of that wonderful song, GREAT IS THY FAITHFULNESS. We change, the seasons change but the great three-in-one, Father, Son and Holy Spirit remain changeless. We can count on them! What a beautiful path to stroll down while conversing with the Lord! Dear David...You are a person after my own heart. I do NOT like winter and snow either but I must admit that this is one beautiful picture and song title. Rodney Olsen, don't you be trying to get that David to go to Perth...He has to get to Bristol, England first!! I have to admit, I really don't like winter either. The one and only day of the year I actually like snow is Christmas!